Whether you're dressing up for a Thanksgiving event or simply need a great costume for another occasion, you can make or buy a beautiful Native American outfit to fit children or adults. This is a great way to celebrate your heritage or learn a bit more about United States culture and history. 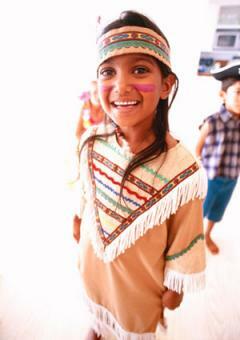 Making an Indian costume is easy and fun! You don't need even need to break out the sewing machine; this easy costume comes together with fabric glue. Expect to spend about two hours on the costume which you can customize to fit your size and personal taste. Starting at the shoulders, cut a large V-shaped yoke from the lighter tan t-shirt. The V should reach to about the waist of the person wearing the costume and should be the same in front and back. Set the remainder of the t-shirt aside to use later. Carefully arrange the lighter tan V yoke over the top of the darker tan t-shirt. Adjust so that it is even in both the front and back. It can help to use a dress form for this step if you have one available. Secure the yoke in place with pins. Place a piece of cardboard inside the darker tan t-shirt to avoid accidentally gluing the layers of fabric together. Remove just a few pins at a time and apply a thin layer of fabric glue between the yoke and the darker t-shirt. Continue until the entire yoke is glued to the darker shirt. Allow this to dry. Now it's time to decorate! Carefully glue fringe along every raw edge of the lighter tan yoke. Glue more fringe on the cuffs of the sleeves and the hem at the bottom of the shirt. Allow the glue to dry. Add ric-rac and braid to cover any remaining raw edges and to decorate the yoke. After the glue dries, your tunic is done. Fold the tan fabric into a strip about two inches wide and 24 inches long. Wrap the strip around the head of the person who will wear the costume to find the appropriate size. Allow the ends to overlap. Glue the ends together. Add decorative trim to the headband and let the glue dry. When you're ready to wear the costume, slip on the tunic. Put the headband on your head, and use face paint to decorate your face. Pair the tunic with leggings for girls and women or tan pants for boys and men. You can also purchase a very nice Native American outfit in any size. Consider these options. 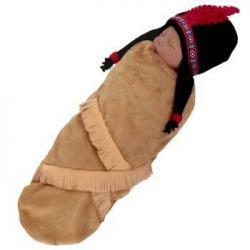 Native American Papoose - The littlest member of your family can wear an Indian costume too! This adorable papoose outfit fits newborns up to three months. It has a cozy fringed bunting and feathered hat and retails for about $35 from HalloweenCostumes.com. Toddler Girl's Lil' Princess Native American Costume - This sweet costume from Amazon fits sizes 3T through 6T and includes a fringed dress, boot covers, and a woven headband. It retails for about $25. Native American Princess Girl's Costume - This beautiful option from Chasing Fireflies will capture her imagination. The pretty white faux-suede knee-length dress is decorated with pale blue and white beaded fringe and comes with a belt. You can purchase matching accessories, including a headband, boot covers, and drum. The dress comes in size 4 through 16 and retails for $70. Boy's American Indian Costume - With its fringed, faux-suede top, matching pants, and colorful headband, this affordable option from Oriental Trading Company is perfect for boys of all ages. It comes in sizes 2T through boy's large and retails for about $25 to $35, depending on size. Women's Native American Princess Costume - This is a gorgeous, grown-up version of the girl's costume from Chasing Fireflies. The white faux-suede dress features short sleeves and pretty turquoise beaded fringe trim. The included belt has beaded medallions. You can also buy accessories like bracelets, a drum, and a headdress. The outfit comes in sizes 4 through 14 and retails for $80. Native American Women's Plus Size Costume - You'll look great in this knee-length tan fringed dress, belt, headband, and matching boot toppers decorated with yellow piping and multi-colored beads. This plus size costume retails for about $35 from Spirit Halloween. 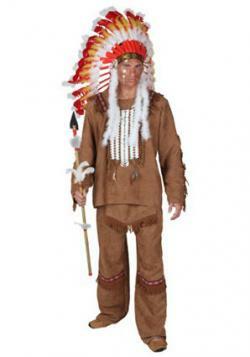 Deluxe Men's Indian Costume - Featuring tan faux suede pants and shirt and a single feather headband, this attractive option from HalloweenCostumes.com comes in men's sizes small through extra large. You can also purchase an adult plus-size version or upgrade to a more elaborate headdress. The basic costume retails for about $35. 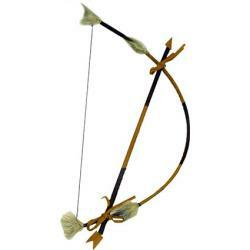 Native American Indian Bow and Arrow - This option from Amazon.com is the perfect size for older kids and adults. It retails for about $11. Red and Orange Native American Headdress - Most costumes come with a simple headband or basic headdress, but you can upgrade for a more dramatic look. This red and orange feathered option from Party City is sure to turn heads. It retails for about $40. Native American Drum - With a diagonal strap and feather trim, this drum adds the perfect touch to any outfit. It sells for about $8 on Amazon.com. Braided Wig - Don't worry if your hair is light-colored or super short! You can simply wear a wig to complete your outfit. This option from Party City features a center part and long braids and retails for about $10. Dressing up as a Native American is lots of fun, whether you're taking part in a Thanksgiving pageant, participating in a cultural event, or simply playing dress-up. Take some time to find or make the perfect outfit and accessories so you can embrace your character with confidence.